Portland's longest running and most important beer festival of the year is coming to Waterfront Park next week. 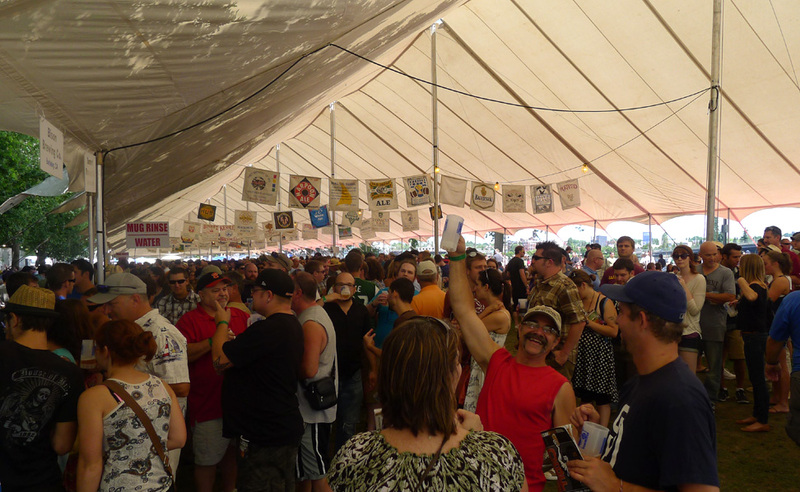 You've may have heard of it: the Oregon Brewers Festival. There are a few changes for this year, which I'll get to shortly. It's sure to be another good year. If you take issue with the notion of the OBF being the most important beer event of the year, you need to understand the history. 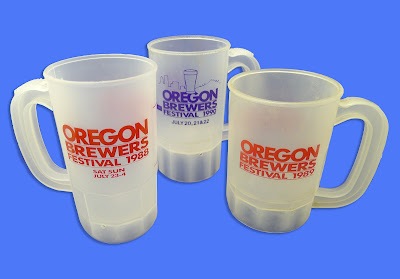 The original Oregon Brewers Festival in 1988 was the first event of its kind here. It provided craft brewers with an opportunity to show off their beers to a mainstream audience (all ages have always been welcome) in a terrific setting. Countless smaller events now dot the annual calendar, but the OBF is the one that started it all. Maybe the biggest change for 2013 is the extra day they've added. Yep. Things get underway on Wednesday this year. This change is the result of growing popularity and limited space in the park. If you can't increase the size of your space, you increase the amount of time you're open. Simple stuff. My guess is Wednesday will be a great day to sample beer. It will take a year or two for the masses to catch on. Well, that's what you hope. Another significant change is the shift away from the traditional plastic mug to a glass. I've talked about this before and it's a big deal. The plastic mug was a fixture at the OBF for 25 years. I know. I have a box of them in my basement. Why the change after so many years? Partly it's the festival's desire to be more environmentally friendly. A lot of people will keep the logo glass. For those who don't, glass is more easily recycled than plastic. The other reason is taste. Beer tastes better from a real glass. Plastic can interfere with that process. No more. The final major change (in my estimation) involves the Buzz Tent, which is out this year. This reality is buried in the press materials and some people will be confused when they arrive at the festival and start looking around. If you don't know, the Buzz Tent is where you typically find special one-off beers. 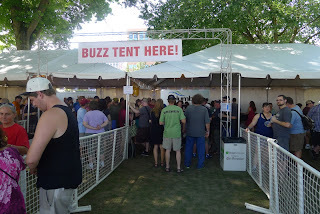 Tastes are more expensive in the Buzz Tent, but the upside is shorter lines and great beers. It was a refuge for me last year when the lines under the tents got crazy. They are apparently working out some logistical issues and hope to bring back the Buzz next year. They expect in the neighborhood of 80,000 attendees from around the world this year. This is the number they've been quoting for several years and it's based on the number of wristbands put on wrists. Of course, some people (like me) claim several wristbands during the event. Yet it seems to attract more and more people every year. I'm mystified that the attendance number hasn't officially gone up. Maybe this is the year. There are 82 participating breweries pouring 84 beers this year. That's obviously a long way from the first year, when 22 breweries were involved. While this is the Oregon Brewers Festival, breweries from 12 states are involved: California, Colorado, Delaware, Florida, Hawaii, Minnesota, Missouri, Montana, Ohio, Oregon, Utah and Washington. They say 30 beer styles are represented and that fruit beer is the most common with 15 taps. This runs counter to tradition, in which IPA has been by far the most common style. Hopheads need not despair. By my reckoning, 16 beers are either straight-up IPAs or some variation thereof. For example, Base Camp's In-Tents IPL and Dunedin's Subtropical IPA are variations on IPA, but neither are accounted for in the IPA category. It's all good. For what it's worth, I'll post a short list of my own tasting targets next week. I'll follow that up with some notes on what I actually find at the festival. For now, all you need to know is the event runs Wednesday through Sunday in Waterfront Park. There's a lot more info on the event website here, including the hours, beer list, music lineup, food list, etc. One of the great things about the OBF is that you aren't forced to buy an exorbitantly expensive tasting package to enter the grounds. Entry is free. If you want to drink, you purchase a glass for $7 and tokens for $1 each. Pretty cool. There are a few places around town selling glasses and tokens in advance if you want to save some time (advance prices are the same). Those businesses are listed on the event website. I have not delved deeply into the materials this year, but I was wondering why I couldn't find buzz tent info: now I know. That's a substantial blunder, but probably only a few diehards like us will notice. I really enjoyed the Buzz Tent last year. Sad to see it gone and hoping they get the unspecified logistical issues figured out for the future.